You know I only recommend cool software to you. I have recommended Netscape or Firefox for tabbed browsing, iTunes for your best music experience, Blogger, Hello+Picasa for managing your photos and Notes Buddy. Today, please say hi to Konfabulator. Please take a look at my Desktop below running Konfabulator. My desktop showing Konfabulator in action. Notice how it dimmed my current workspace (IE browsing my own blog) to show all the active widgets. a photo frame that shows photos from My Picture folder - it changes every 5 minutes for new photos. Currently, the photo frame is showing a photo of my trip to Giza, Egypt, with Pyramid of Khafre as backdrop. The real beauty of Konfabulator is that it is easily accessible by just pressing F8. 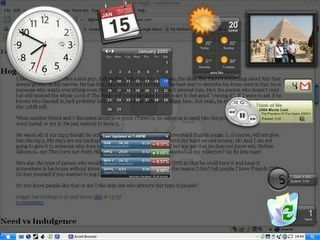 Once you press F8, all these widgets appear in the foreground so you can glance at the weather, look at your stock, admire yourself in the picture frame and tell the time. Press F8 again and these widgets is hidden and you get back to your work. These widgets will also get updates online so if you have broadband, it is really useful. I trust Ringgit's recommendation. 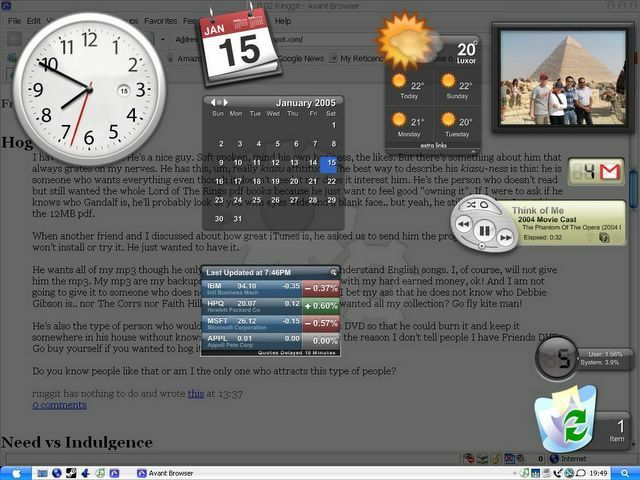 I tried this cool widgets...BUT BUT BUT, remember how 'F8' key is set as Page Down for the Mainframe environment. Today, I kena up side down while supporting my US folks :( , meant to page down, yet the cool widgets kept showing up ..aii! why F8 ?? alternatively, I can reconfigure my fuction keys setup ....geeee, for YEARS used to F8 as page down, F7 as page up, how ?? You can configure Konfabulator to use any function key.. or combo eg SHIFT-F8 or ALT-F10 or whatever.